With new tea blends, sometimes we come up with the tea first and struggle to think of the perfect name. Sometimes we come up with a cool tea name and then spend weeks tweaking the formula until we find just the right taste. And then the logo works its way into the equation. Sometimes, however, everything comes together in a flash, and that’s what happened with this tea. We were looking for ideas for a fundraiser, using a tea that had a real American West flavor to it. Being a tea bar/bookstore combo, a literary allusion makes things even better. 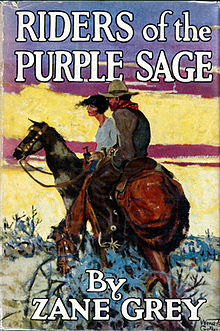 As we were throwing out ideas, someone said “Zane Grey.” The next obvious leap was “a Zane Grey Earl Grey.” The next obvious leap was to Zane Grey’s best-known book, Riders of the Purple Sage. The fundraiser is for the Yellowstone Wildlife Sanctuary here in Red Lodge, and two of the well-known noisy critters right by the entrance are a pair of coyotes named Bonnie and Clyde. We wrapped everything up by tying in the Wildlife Sanctuary and naming the tea Coyotes of the Purple Sage. The ingredients for the tea came together pretty quickly as well. Black tea and bergamot oil are the base for most Earl Greys. Sage was pretty much a mandatory ingredient. A bit of lemon verbena and and lemon thyme added more citrus notes and the thyme goes well with the sage (I will resist breaking into song here), and a subtle touch of peppermint finished off the blend. Posted on 14 September 2012, in Styles & Blends and tagged bergamot, Coyotes of the Purple Sage, earl grey, lemon thyme, lemon verbena, logos, peppermint, Riders of the Purple Sage, sage, tea, Zane Grey. Bookmark the permalink. Leave a comment.